We have sent out a 34-question long survey and reached 285 developers. 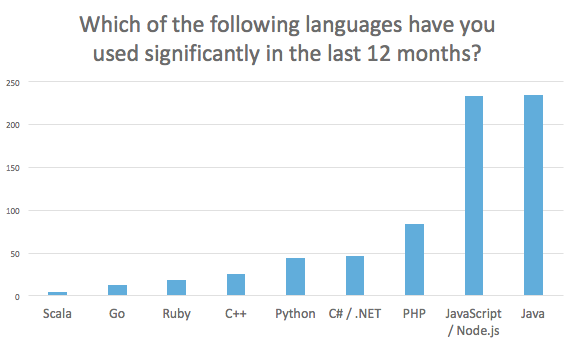 Here’s the first interesting fact: 267 of them use Node.js regularly in 52 countries. When I saw the results of the Stack Overflow Developer Survey, I know I had to go deeper (insert Inception joke here). 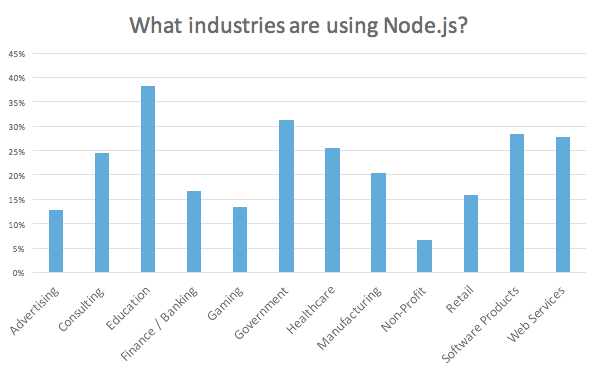 As the marketing guy at RisingStack I currently don't do much programming, but I wanted to know more about what is Node.js used for. 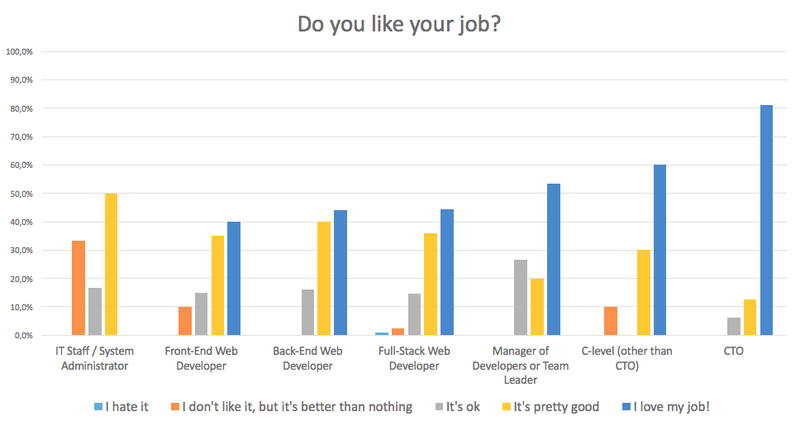 Since the Stack Overflow line-by-line dataset wasn't accessible to the public last week, I decided to run my own survey to get some insights and share them with you. 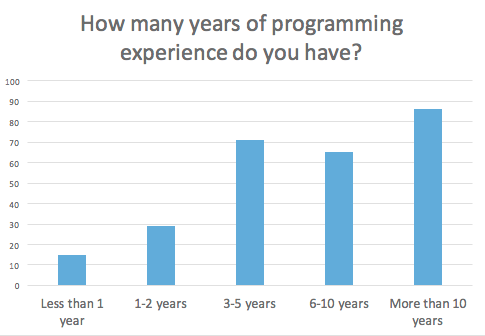 What the heck, 1/3 of you have 10+ years of programming experience? You were writing code years before even thinking about college or even before high school? Well, Harrison Ford was a carpenter until his 30s, so I guess I still have time to be an awesome developer beside doing my marketing things. The evergreen Bachelor's. 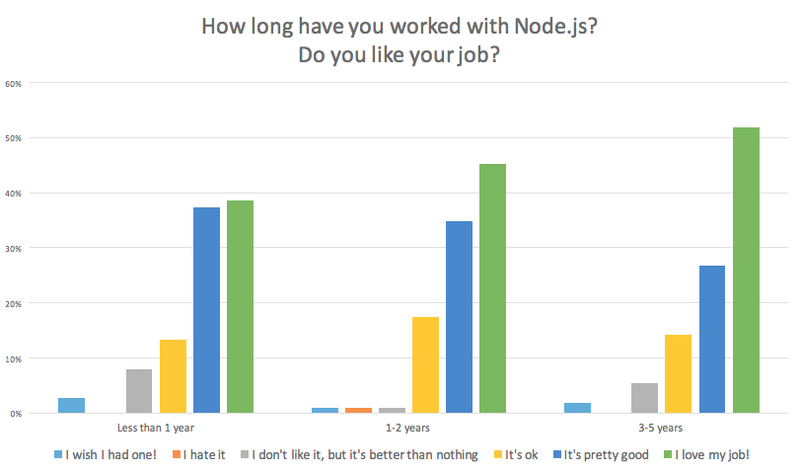 Nice to have, but happiness doesn't require a degree: almost all of you proved to be super enthusiastic about your work with Node. Mongo and Express busted out, and the rest follows them. 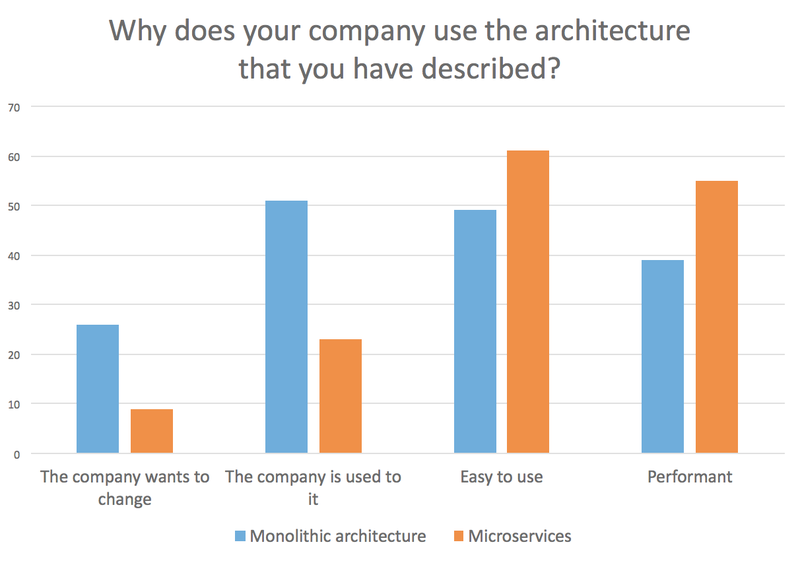 Let's take a closer look at microservices. The question was what infrastructure do you use, and why are you using it? It's nice to see that more and more companies are building their infrastructure on microservices from the beginning. They didn't regret that decision. On the other side, the monolithic architecture is just a big old monster in a dark room that no one wants to open. Some developers even described it as chaotic, and some didn't know much about this emerging trend yet. 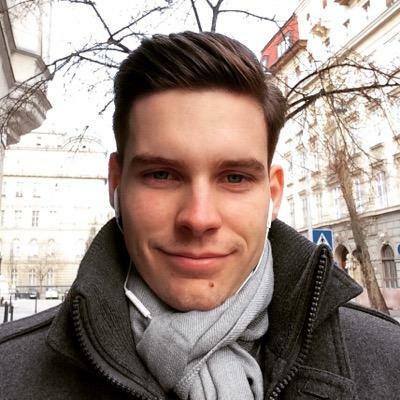 One more reason to learn Node: the more you work with it, the more you love your job! I love statistics so much. Obviously it doesn't mean that you will automatically love your job if you use Node, but it can definitely increase your chances to get a better offer if you know a thing or two about it. This one isn't very surprising, but the chart can be a good tool to gain motivation if you are aiming for a promotion. It could be interesting to dig deeper into the differences between CTOs and other C-level executives: less stress? More fun? Or something else? We can find out next year. 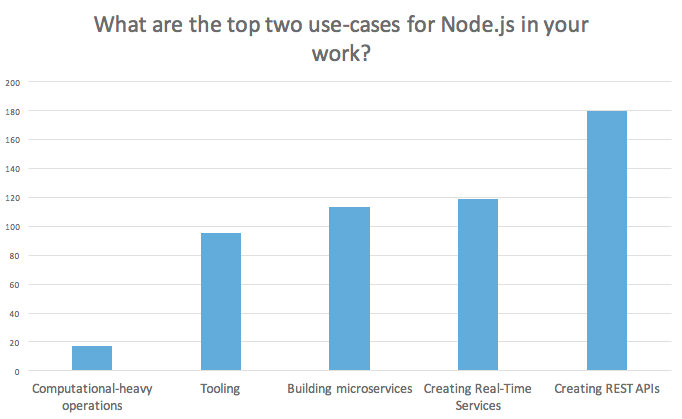 We took a look at what is Node.js used for at work. 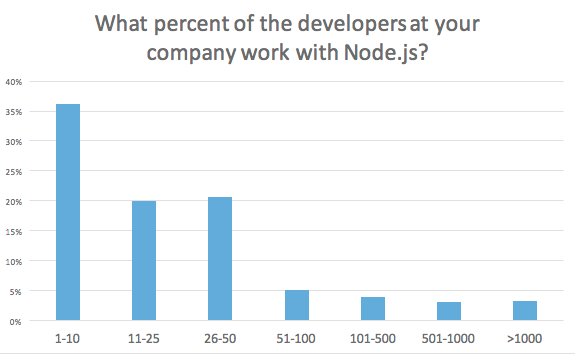 One-third of Node developers don't commute at all. Remote jobs are heaven for some, but hell for others: it seems you like working outside the office. Developing new features was always on the table, but learning new skills is now more important than ever. 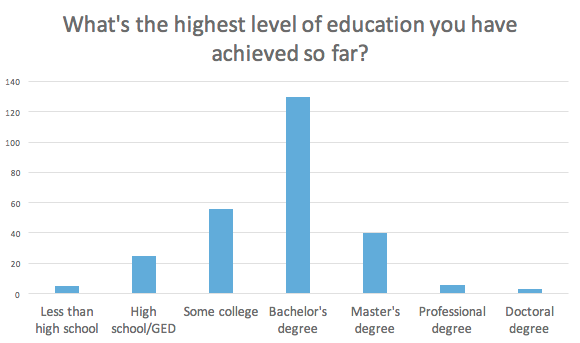 It's interesting to see the spike on education: and we are not talking about universities or colleges here. Most of these companies are offering a SaaS platform with recurring billing or making money with direct sales in both B2B and B2C directions. Another evidence for the rise of the MOOCs. 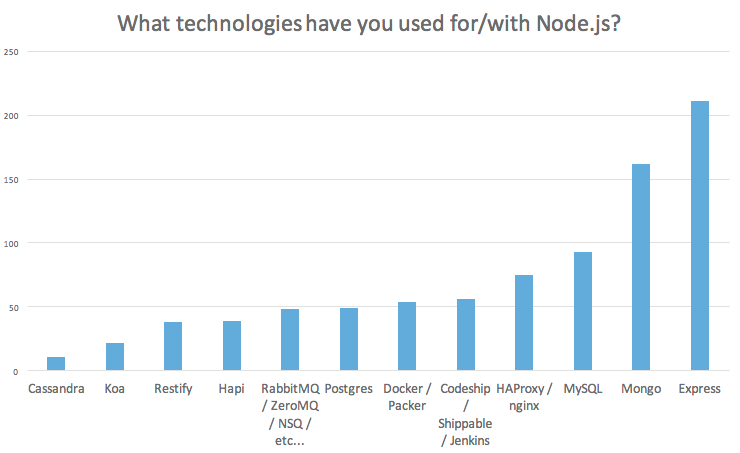 Companies seem to be experimenting with Node.js. This overview shows that they try it on a part of their architecture first, but then they tend to build the entire infrastructure on it. We have received many more unique answers on this one, including one developer who said almost everything. Others mentioned web apps and web scraping. 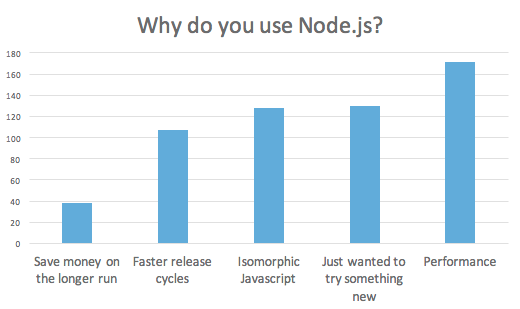 I also wanted to find out the core reason to answer why developers started using Node. Just like in marketing, saving money is important, but it's simply not the main reason to start using a new tool or framework. The benefit of the new thing is the one that matters, and performance is in the first place for a reason. When Google experimented with displaying 30 search results instead of 10 with an extra 0,5 seconds loading time, the site's traffic dropped by 20%. 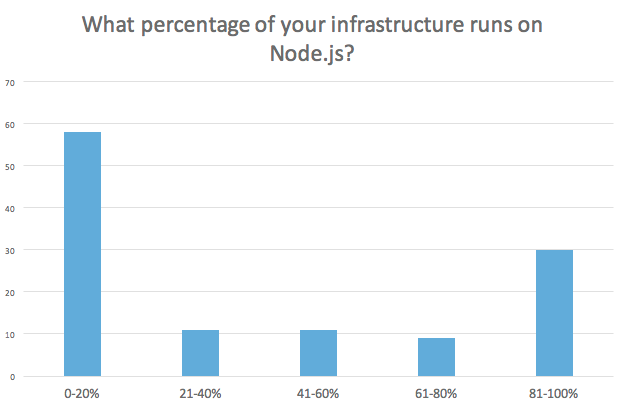 Developers are using Node.js because it's insanely fast - both talking about performance and go-to-market time. And - according to a random answer - because it's hipster, of course.